Aqua Buff 1000-F Fast-Cut compound is formulated to remove 400-grit and finer scratches from gelcoat, primed and painted surfaces. It also removes oxidation and buildup from marine and mold surfaces. Instructions: 1000-F Fast cut compound onto the surface to be compounded with a brush or cloth, several square feet at a time, and mist the surface with water. Use one-half the usual amount. Machine with a clean damp compounding pad at 2500 rpm or higher. Should the compound become dry while being buffed, re-wet by misting the surface with water. Repeat the process to eliminate scratches on exceptionally hard surfaces. 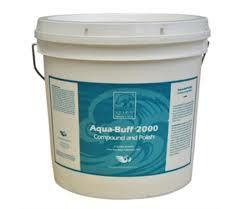 Follow with Aqua-Buff 2000 compound/Polish for a high gloss, swirl mark-free finish. Aqua-Buff 2000 Compound and Polish is formulated to remove 800-grit and finer scratches from gelcoat, acrylic and primer surfaces, including plugs, molds and finished products. It also polishes these surfaces to a bright, clean finish. Instructions: Spread Aqua-Buff 2000 Compound and Polish onto the surface to be compunded with a brush or cloth, several square feet at a time, and mist the surface with water. Immediately machine buff with a clean, lambs wool-type pad at 2500rpm or higher .Should the compound become dry while being buffed, re-wet by misting the surface with water. Repeat the process to eliminate scratches on exceptionally hard surfaces.